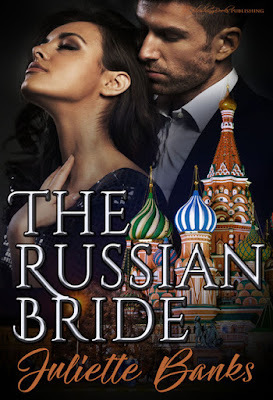 I am so thrilled to have Rachel de Vine on my blog today sharing her latest book The Russian Bride written under the name Juliette Banks. New name ... but same awesome author!! Viktor took her to a dark and frightening place. It was the love of James that saved her. In the main room there were already a large group of men with their slaves or submissives, as before. The women were in various outfits, but none was dressed as Natasha was. She caught several inquisitive looks, and one man smiled and winked at her. She decided that she had better not respond to him and risk making Viktor angry. He led her by the hand as they went to sit on one of the chairs; or at least, Viktor sat on the chair, and she knelt alongside. There were several displays taking place in front of them, involving a woman being fucked by two men, and another woman being spanked by her Master’s friend, while sucking off a second man. Meanwhile, waiters were winding their way between the various displays, making the whole scene to Natasha seem positively surreal. The women all seemed to be willing victims. There was no sign of any coercion that she could see. Viktor bent and whispered in her ear. “Now is the time for our little display, my dear. There’s no need to worry about it, though.” As if to reassure her, he put his hand under her frock and stroked her bare flank. He spoke out to the men present. Grigory came alongside them both and indicated to Natasha that she should place herself over Viktor’s lap, which she did, without any hesitation. Already, before either of the men had laid a hand on her, she was excited and could feel the dampness between her thighs. Grigory took the bottom hem of her dress and brought it up and over her body so that her bottom was exposed to the waiting men, all of whom had stopped what they were doing and had turned in their direction. Viktor began to spank her with his hand, slapping her rump hard, one cheek at a time. The room became silent, except for the sound of his hand striking her cheeks. Natasha began to pant a little, as she responded to the stimulation of the spanking. She pushed her bottom out more, as though asking for him to continue. Her wedding dress was demure, but underneath she had a bare, spanked bottom.